We will customize the show according to your needs. Just let us know what you would like! 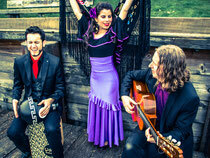 We have an extensive repertoire of Flamenco, Rumbas and Spanish music. Please find some of our options below. Please note that you may also request additional dancers, and/or other instruments (flute, violin, trumpet, etc) for your unique customized show. Toque Flamenco is able to accommodate shows in Vancouver and surroundings (Richmond, Burnaby, Coquitlam, North/West Vancouver, Surrey, Delta, New Westminster, Victoria, Okanagan, etc.). A tribute to classic rock influences, including Pink Floyd, Led Zeppelin, Kansas, U2 and The Police, with lots of flamenco flavour. Ideal music for concerts, festivals and bars. with Dance, Singing, Guitar & Percussion (Cajón, Palmas, Jaleos). Ideal music for concerts, festivals, fundraisers and charity events. Enjoy of your favourite melodies with a "Flamenco style" played by Toque Flamenco! Ideal music for weddings and quiet events. Ideal music if you want to make people dance! Book Toque Flamenco as your Wedding / Party Band today and make your event unique!